Over six months ago, Turkish political cartoonist Musa Kart and several of his colleagues from Cumhuriyet newspaper were arrested in the midst of their government’s ongoing crackdown on independent media following the failed coup last July. After an unnecessarily long detention, they were finally indicted last month on spurious charges of supporting Kurdish militants and the Gulenist movement. Last week the cartoonist’s wife Sevinç Kart gave a moving speech at the European Parliament in Brussels about her husband’s commitment to being “a voice for people with no voice” through his work in Cumhuriyet. 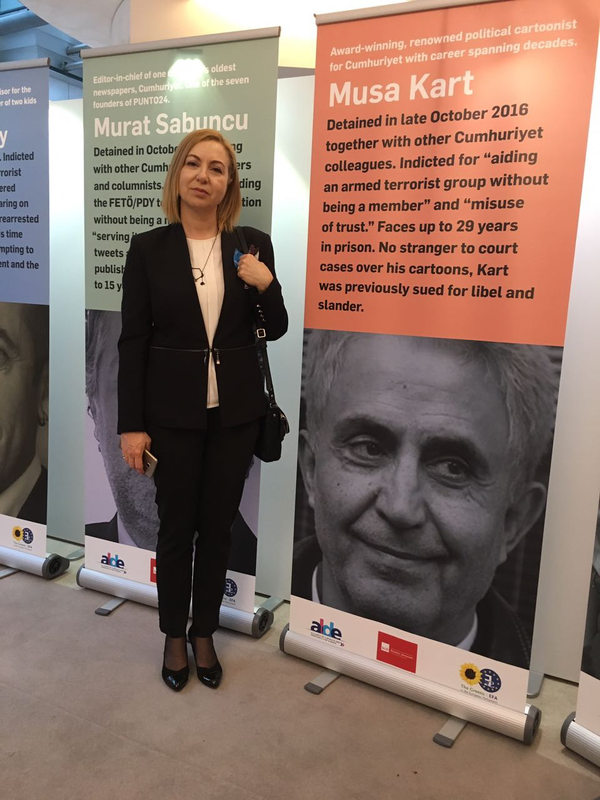 Kart spoke in observance of World Press Freedom Day and the launch of a European Union-sponsored public exhibition called “Expression Interrupted,” which focuses on the 141 journalists currently imprisoned in Turkey. Just a few years ago, Turkey was well-positioned to join the EU, but that possibility seems increasingly remote in light of President Recep Tayyip Erdoğan’s numerous human rights violations and proposed reinstatement of the death penalty. As the closest person witnessing Musa’s life, I could say that he performed his work with great enthusiasm and respect. He sketched every antidemocratic application, injustice, unlawfulness witnessed in every political administration without being afraid…and without giving up. In other words, he did what a humor master was supposed to do. But, this administration did not overlook humor and criticism and chose to punish intellectuals like Musa with their own methods. No other times, [have] opposition and independent press encountered such heavy pressure and threat like today. Musa Kart has long been a critic of Erdoğan, winning the 2005 Courage in Editorial Cartooning Award from Cartoonists Rights Network International after he successfully fought a lawsuit over a cartoon depicting the then-Prime Minister as “a kitten entangled in a ball of yarn.” In 2014 he was acquitted of insulting Erdoğan in another cartoon, avoiding a prison sentence of up to 10 years.